Courtesy of Bungalow Colony, Inc.
Q: Why did they go into the apartment building so recklessly? Q: What is the first song as Mike and Brian patrol? Q: Why did it take the backup so long to get there? It's not hard to tell that David Ayer grew up on the mean streets of South Central, Los Angeles. Training Day, The Fast and the Furious, Dark Blue and S.W.A.T. all showcase his passion for writing screenplays about these streets and the role that police officers play in them. His two films as director (Harsh Times and Street Kings) showed that he could also direct hard hitting dramas depicting the underbelly of the L.A. and the police force. End Of Watch marks Ayer's second film as both writer and director. Jake Gyllenhaal and Michael Peña star as a two young officers in the Los Angeles Police Department. 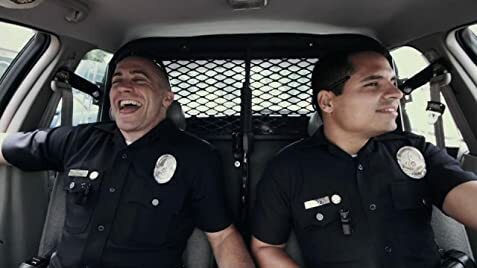 Using the "home footage" format of filmmaking, End Of Watch shows us the ups and downs of these two young officers as they work, love and fight in the streets of Los Angeles. In terms of subject matter this film doesn't cover anything really different. Its about cops dealing with their issues at home and on the job. 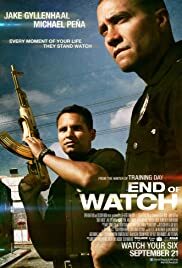 This topic has been covered countless times but what makes End Of Watch different – and better – then many of its predecessors is that it holds realism as its number one priority. This is one of the most realistic portrayals of police life ever put to celluloid. The day to day lives of these two best friends are shown in a format that is both convincing and horrifying. It doesn't flinch away when showing the disturbing aspects of this high pressure career. Using everyday video sources (chest mounted cameras, vehicle cameras, P.O.V angels, aerial shots from police choppers) definitely gives the film an unprecedented level of proximity to cops in the line of duty. Unfortunately, this format doesn't always work. Some chaotic scenes become a little bit confusing when the camera is constantly changing from first person shots to third person angles. But for the most-part it works well. Gyllenhaal and Peña provide us with two highly believable characters and their chemistry is palpable. Whether they're talking about the women in their lives or having a friendly argument about racial stereotypes, these two actors ensure that we stick with their characters through every step of the way. Gyllenhaal continues to solidify himself as one of the best actors around and Peña delivers one of his best performances to date. It's got a great script and a focused story that is handled confidently and told well. David Ayer has crafted an intense, hard hitting drama that benefits from the two excellent performances by the two leads. 175 of 223 people found this review helpful. Was this review helpful to you?